As students of prophecy, we know what happens before, during and after the 1000 years. But most in the world have been taught to trust the Popes and their cohorts in all religions to believe the 1000 years is the start of Christ's reign on earth. Notice what the Vatican teaches on this. "Therefore peace being made, and every evil suppressed, that righteous King and Conqueror (Jesus Christ) will institute a great judgment on the earth respecting the living and the dead, and will deliver all the nations into subjection to the righteous who are alive, and will raise the righteous dead to eternal life, and will Himself reign with them on the earth…" -St Lactantius, The Epitome of the Divine Institutes, Chapter LXXII, in Early Church Fathers, Ante-Nicene Fathers, Vol. VII. "Though already present in his Church, Christ's reign is nevertheless yet to be fulfilled "with power and great glory" by the King's return to earth… Before his Ascension Christ affirmed that the hour had not yet come for the glorious establishment of the messianic kingdom awaited by Israel which, according to the prophets, was to bring all men the definitive order of justice, love and peace." -Catechism of the Catholic Church, The Profession of Faith, Section Two, Article 7, Subsection I, #671 & 672. And so as the dying god of this world was able to get the Jews to believe when Messiah came he would reign on earth, he is still using the same lie to this day because it worked so well back then. And yes, this lie has been embraced by Rome all along to the point the Pope of today echoes this lie with pride. Notice this headline from November 26, 2014 from the National Catholic Reporter. "The world will end with peace, not annihilation, Pope Francis says." And so, does the SDA church agree with the Pope of Rome on this so as to teach Christ will set up His kingdom on this earth at His second coming like all those that believe in a secret rapture and seven year tribulation believe? "We Still Believe…Jesus Will Usher in a New World Order… He will come to inaugurate a ‘new world order’ that will be unlike anything the world has known. Someday soon, you and I will live in that new world….If Jesus were to come tomorrow, would you be happy in the new world He will bring with Him? But neither democracy nor communism nor socialism is God's system. His eternal kingdom is built on different principles and will supersede all earthly governments and powers…and the next great event in the world history will happen when God sets up His kingdom that will last forever." -General Conference President, Robert Folkenberg, in We Still Believe, p 23, 28-29, 118-19. And when does the SDA church believe this New World Order will begin? Are they talking about New Jerusalem at the end of the 1000 years as the Bible says? Or do they claim it happens at the second coming like Rome says? "Thus shall we anticipate the establishment of God’s eternal kingdom of peace at the second advent of our Lord and Saviour, who is the Prince of peace." 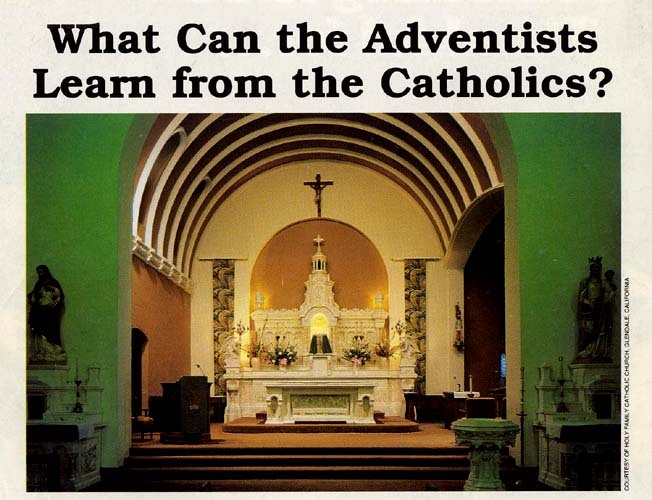 -Annual Council of the Seventh-day Adventist Church, in Adventist Review, December 5, 1985, p 19. "…the establishment of the literal kingdom of God ushered in by the glorious second coming of Jesus Christ." -Douglas Devnich, Director of Public Affairs for the Canadian Union Conference of Seventh-day Adventists, in Ministry Magazine, November, 1983, p 24. "We believe that soon Jesus will come to this world and usher in His kingdom of peace, joy, and righteousness." -General Conference President Neal C. Wilson, in Adventist Review, December 13, 1979, p 6. As students of prophecy we know that Jesus does not touch the earth when He returns. The Pope and the SDA church are correct however when they say there will be peace on earth for 1000 years. But only because the peace comes from everyone that follows their lead are actually dead as "dung upon the earth" for those 1000 years wherein Satan's true name Beelzebub comes to be defined in reality. He is the god of dung and all those that believed his lies are now rotting under his feet as he wanders the planet contemplating his eternal demise when the 1000 years finally ends. This lie of Satan will make everyone believe that when Antichrist appears that he really is Jesus Christ Himself setting up his kingdom of peace on earth. And that is why the Vatican, all the Protestant churches, the Jews who believe the Messiah will come soon to reign on earth and now the SDA leaders are being moved by Satan to teach this lie to their complacent flock. But praise the Lord, the obedient elect of God cannot be deceived. Biblical reality is, only those ignoring the call of Jesus Christ to "come out of her my people" who sit comfortably in apostasy awaiting the arrival of Antichrist thinking he is Jesus Christ will fall for this long prophesied lie. And so pray for them. They still have some time to repent and come to accept Jesus Christ as Lord.